– IPE Oil Finish retails for an expensive $60.99 per gallon. Fortunately, the IPE Oil spreads extremely well. Coverage per gallon was over 300 feet per gallon. This is double the coverage on a soft wood such as Cedar or Pressure Treated Pine. We only used 2.5 gallons for the 800 sq. foot test deck. – Small amounts of algae were present after 2 years around the outside railings and in corners. We did not find any mold growing in or on the IPE Oil Stain. – Coverage is excellent. We applied with a pad applicator, waited 20 minutes and back wiped the excess stain residue. The entire project was completed in about 3 hours. – The IPE Oil did not color shift/darken noticeably. No mold/mildew and very little dirt accumulation. – Future maintenance would require a wood deck cleaner and some scrubbing to alleviate the wood of dirt. This would be enough prep prior to applying a maintenance coat of stain. – We liked the IPE Oil overall. Easy to apply, coverage per gallon was excellent, and the finished look was stunning. This would be a decent product for any exotic hardwood that requires annual maintenance. Go with the RAD in Light Walnut. Thank you! And the two step kit? Rad also? And bleach run off ok? Yes on the prep kit. Make sure to rinse the bleach well after the house washing and you should be okay. We built an ipe picnic table. Is there an oil that is safe for food? Try Defy Hardwood stain instead. Hi, looking at doing my annual oiling for cumaru decking. Used Cabot Australian Timber Oil last fall and was very unhappy with how long it lasted. The majority of the deck is now grayed, what should I use to clean it up before oiling? Or just power wash it? If we’d like to stick closest to the natural look of the wood, which oil would you suggest? Strip and brighten for prep. Try the IPE Oil for this. just had IPE deck installed. My contractor used this oil to finish it but after three days it is still sticky and shiny in most parts. Should I let it sit or is there something I need to do? It is still sticky to the point if I walk on it it will leave foot marks. You may need to strip it and start over. You should not stain brand new wood right away. Needs to weather a few months and be prepped first. Prep with the Restore A Deck Stripper and Brightener Kits. I have a 500 sq/ft ipe deck and I’m building a pergola over one side of it. I have used nothing but ipe oil on it for that last 9 years and love it. Don’t have the quid for ipe lumber so gonna use all cedar. Is the ipe oil an option on the cedar? If not, For color matching any ideas. You can use the IPE oil on cedar but it will not match the IPE wood after stained. It is virtually impossible to match cedar wood to the beautiful IPE wood. Closest would be a darker brown with a hint of red deck stain. Maye Rustic Brown from Armstrong Clark. The deck is 150 feet from ocean in FL panhandle and receives full sun. Based on your reviews we are planning to use Armstrong Clark mahogany for our ipé deck stain (pictured below). We have KDAT pine substructure (which is part of the outdoor living space and will be seen) and we have already stained it with Sherwin Williams Super Deck IR Reflective Exterior Waterborn deckstain. We want the KDAT to look like the ipé. How do we change the KDAT stain to Armstrong mahogany? Ken, it is very hard and nearly impossible to get pine wood to look like IPE when stained. The IPE will always look better and richer. The easiest thing to do would be to stain the floor first with the AC and then find an SW color of the same type that is close as possible to the IPE flooring. The harder way to approach this would be to remove the SW first and then stain the flooring and the posts with the AC products. Closest AC color that would resemble the IPE/Mahogany on the floor would be the Chestnut for the pine. Either way, it will not match exactly. Thanks for your prompt reply! Two follow up questions: How do you rate the SW product vs the AC? How do I remove the SW? We may want to use AC everywhere for simpler maintenance. We are not fans of the SW products for decking but will work fine for your vertical posts.. To remove the SW, you will need to strip, possibly sand, and brighten after to neutralize. 4-12 hours depending on the temps. Just tried this last week on my IPE fence. Goes on very well with a brush. Better and quicker than using a rag to apply. The stain with some coloring seems to soak in better and normalize the color a bit more, for a darker reddish brown look. I stained my deck with IPE Oil but thinking of switching to Armstrong Clark Amber next year to give it more of a yellow/brown look rather than the brown/red look. Also doing it because it seems AC is a better quality stain. What do you think of the idea? Can I just apply the AC over the IPE Oil or do I need to strip first? Thanks! Strip it. Look at amber color. For IPE, you will need to reapply annually. Thanks. Is the color between IPE Oil and Armstrong Clark Amber that much different? Or are they about the same? IPE Oil seems to be more brown while the AC Amber is more a golden tint. IPE Oil works decently. Also look at the Armstrong Clark in Mahogany color. We used ipe oil on 1500 Sf Brazilian masauranduba 4" deck boards in June 2015. Within 4 mos. the wood changed from a beautiful red brown to silver. DO NOT USE THIS OIL unless you want to risk water stains showing up every time it rains or using a hose. We sealed a 320 sq. ft. Ipe deck with Ipe oil, following instructions to the T; one week later, the customer insisted that we refinish the deck due to extensive water stains. 1/3 of my entire income for a 3 week job installing a rooftop deck and building planters, was spent refinishing the deck and applying another coat. I have little confidence that the product will hold up. Mineral deposits drying from water on top of a newly applied stain can happen no matter what brand you use. This wipes or rinses off. Typically this issue goes away in a couple of weeks. Leave it alone as it is probably fine. It will need another application next year anyhow. My question is about loose boards…I do not see nails or screws fastening down the boards. Any ideas on how to best secure these? Those are hidden fasteners. Can you get under the deck? If not then you will need to pre drill and secure from top with stainless steel screws. I have a 1200 sqft IPE deck just completed. The construction company made the mistake of using Cuprinol oil for impregnated wood. As a result, the finish is uneven and I guess that it will wipe off with some rain. Should we sand the deck before applying IPE oil? The property is located in Sweden with cold snowy/wet winters and dry warm/wet summers. What oil is recommended? Thanks. Strip or sand it off first. Not sure what stains you can get there. Ipe Oil is not available there. Most that we use probably will not be available in Sweden. I am thinking of using Fijian Genuine Mahogany decking offered through Green World Lumber in Toronto Ontario. They recommended I try Messmers UV plus. I tested it out on a sample and I don't like the colour – its got an orangy/red tint to it. I like the way Linseed oil makes the Genuine mahogany decking look, but it doesn't have UV protection i need. Can you recommend a UV/weather protective oil? are their oils with a brownish tone? IPE Oil has more of a brownish tint and can be used on your wood type. Do not use straight linseed oil unless you are okay with mildew and no UV protection. I had a three decks, and two large shade structure built twelve years ago, all made of Ipe hardwood. Finished with Penofin the following years and again seven years ago. We live on the lake in Southern Ontario, the wood takes a real beating; direct sun, wind snow and rain. The entire project still looks great, has required no maintenance but needs a little TLC. I recently power washed the deck and it looks incredible again, my nine year old likes to take the hose to it to marvel at the beauty. I don't want to make a huge project out of this, but want to have the "when wet look all the time". What is the best product on the market to oil the wood for maximum beauty and protection? Armstrong Clark in the Mahogany color. Thanks for the answers to other's questions. This is probably the easiest to understand, best written q&a. Definitely answered my quesrions. You are very helpful. Patient, too. Hope somehow it makes you money! What are the differences between IPE Oil and Armstrong Clark in the Amber? IPE Oil comes out more of a Browny color on IPE while Amber is a little lighter. I notices that Armstrong-Clark has many colors. I'll check out the color considerations. Other than the color, would you say that one would last or protect better than the other? Would the deck preparation for one be different than for the other? Same prep and about the same for longevity. i have a 10 month old Tigerwood Deck in the Outerbanks of Nc. It has turned silver gray. Willa sealer bring the rich red/brown color back? Joe, the deck cleaner and wood brightener will remove the gray and restore the look. The stains will enhance color and prolong the graying. We like the Armstrong Clark in the Amber tint for Tigerwood hardwood decking. Just put in a good sized screened in porch and the flooring and railings are ipe. We live in Northern Virginia and the temperatures are now in the 30-40's. Should we apply a light coat of the oil once we get a day or two of 50 degrees or wait until spring? If we wait until spring, won't the color turn grey/silver? We strongly prefer the present natural brown wood color. We have also installed ipe for the railings on the new deck. Jeff, best to wait until Spring. Using a wood deck cleaner will restore the IPE if it turns slightly gray. Jeff, we like the Restore A Deck Kits for the prep. Typically wait 2 days after prep before applying the oil. I'm building some outdoor cabinets for a covered porch using Ipe. Would Ipe oil be a good choice for a finish on the cabinets? suggestions? Maybe I should have done my research on Ipe before selling the customer on it. Fred, yes that would be a good choice for the IPE cabinets. We just had Ipe Oil applied to our new ipe deck. The color is gorgeous, but the finish looks a bit flat/matte. I would not say its anywhere near semi-gloss. Is this normal for ipe oil? The person applying it followed the instructions to a "T", identical to what you have listed here. We're in Virginia, and because the building phase took longer than anticipated, the stain was only applied in November, with 50-55 degree days. Is this the finish we can expect with this product, or can it be shined up to show the beautiful grain. We do plan another application in late Spring, want to know if there's something we should do differently. Dan, yes that is normal and you should never put a “shiny” type finish on outdoor horizontal wood. It will peel, blister and become a huge issue for you to fix down the road. I am going to install a new ipe deck in the spring. There is a guy over on ipe-deck.com that is selling a product called "Super Shield" that is a fluoropolymer coating designed to last many, many years without chalking, fading, cracking, peeling or allowing oxidation or discoloration or ultraviolet radiation damage of any kind to whatever it is applied to. They claim this will keep Ipe looking new with one application for 20 years. Does anybody know anything about this stuff? Is this real or a load of crap? Tom, it is a gimmick. We used Super Shield. After 1y it is peeling and looks terrible. Stay far away. We are looking for a remedy since SS ruined look of our deck. Stripper first then the cleaner. Brighten when all done with those two. Installing an Ipe deck in Northern Virginia (DC burbs) with curved fascia, which will be made of planed cedar. Do you suggest I stain the cedar with a tinted product to try to match the Ipe Oil finish I plan for the decking/posts? Dan, it is not possible to match cedar wood to IPE when stained. Completely different colors when a finish is applied. Could you suggest another wood that can be planed to form a curved fascia that might work better than cedar? Our original deck was redwood, but the wood bees got into it. Would the redwood be an easier match with the appropriate tinting? Dan, never saw a wood that would match IPE when tinted. We have seen curved IPE decks. It can be done. Don't want to sidetrack this discussion on Stains. Could you send me a note or advise for creating ipe fascia? Dan, we are not builders so we do not know how it is done but we have seen it numerous times. I would assume there is info somewhere on the web. how do you rate cabbots austrialian timber oil on new IPE decking? Andrew, years ago Cabot ATO worked great on Ipe, They changed the formula and now we never use it. There are better brands out available. We have newly installed ipe deck and exterior wall. To color match the trim, I would like the ipe to be darker, almost espresso dark. Do you have any brand of stain recommendations? Can the stain be added to the Ipe Oil for a single application, or done in two stages? Finally, in subsequent years, will the unstained oil be sufficient, or will I need to stain each time? Don, Ipe Oil is not a dark espresso color. Not sure what hardwood stain will work for you as they are not that dark. IPE Oil is already pre-tinted and you cannot add more color to it. Don, I see that your post was from 8 weeks ago. Were you able to find a dark brown stain for your IPE? If so, please let me know what brand and color you used…and how it's holding up. Thanks. HI, I live in LA and have an Ipe deck which was treated every 6-8 months with Penofin since installation 2 years ago.. We noticed that the beautiful wood grain was still evident on the covered portions of the deck which are dry and have less sun exposure; the areas of sun and rain are now so dark you cannot see the grain, even after a deck wash and retreatment with Penofin.. What is the cause of the poor result after the retreatment (and will it recur with the Ipe oil if I try it? ), and is there anything special to do to change to Ipe oil after Penofin?. Lydill, to restore the wood you would need to strip off the Penofin and brighten the wood when done before using a new stain. I live in Minnesota and have a cumaru deck. I've sealed my deck with ipe oil and certain sections/boards are still "tacky" and don't seem to want to dry. Does anyone know a solution? Jim, try wiping down with mineral spirits to remove the excess. Wet rags with water when done to avoid spontaneous combustion. Should I sand and refinish with oil or do a clean and brighten incl pressure wash? Initially thinking of sanding due to slight warpage (I live in the Seattle area and get a lot of rain) but don't really want to sand if I don't have to. If sand….grit size to finish?? Thinking of either the Ipe oil or was told Penofinf for the finish….thoughts? Any overall thoughts on how I should get it back to a bright finish then coat every summer? Andrew, I am not sure. Have you tried contacting the manufacturer for some help? Splattered some Ipe Oil on my stone patio, tried Mineral Spirits to remove. Didn't work very well. Any ideas on what can clean this product off of stone, or is it too late and I should put my barbeque over the tain so people won't see it???? By the way, my Ipe deck was put in last December and by June it had greyed out. Lot of work to oil it again, but totally worth it. Ipe is a fantastic looking hardwood. Paul, I would try a graffiti removed and s stiff scrub brush. I have three medium-sized decks in western Oregon (moderate climate with lots of rain). I can't decide between Messmer's and IPE Oil. I realize that I will need to maintain my ipe once or twice a year to keep up the appearance, but I think the gorgeous look of new ipe is worth the trouble. (After carefully searching suppliers, I ended up with indoor floor-quality decks; stunning!) My decks were installed late last fall in the rain and the rainy and cold weather persisted and prevented a fall application. It is now somewhat grayed-out, but still very nice. My concern about Messmers is that stripping it each year would be more of a hassle than the IPE oil. What do you think? Also, given my situation, what cleaner/brightener product or products would you recommend. I do have a 3100 psi power washer, but worry about using it on my precious ipe. Thanks in advance for your help. R.L, IPE and Messmers perform the same and is reapplied the same way. I would prep with the Restore A Deck Kits then stain with either. Might also want to consider the Armstrong Clark in Mahogany. We had a Tigerwood Deck installed two years ago and we've had it stainend with Messmer's UV Protection. I've been doing some research and it seems to me that Ipe Oil may be the superior product. The Messmer's was okay, but looked dull by fall. Would I get any better penetration with Ipe Oil? Would you be able to give me a recommendation of one product over the other? We live in Southern Ontario in Canada. Thanks. Dawn, I would think you would get the same results with the IPE Oil compared to the Messmers. I have a client who recenty had their IPE deck sanded, cleaned and stained. A short time after (one week) they had a mason come in to put down a patio. Some of the dust from the stone cutting made its way onto the deck and now the homeowner is having a tough time removing it. She is afraid to use anything other than water and a sponge. Do you think the stain could have still bet tacky and the dust dried into it or does she need to use something more than water? If so can you recommend a cleaner that will take care of the problem? Jeff, I have no idea what will remove the mortar dust. more then likely she will need to strip done the deck stain and start over. I have an ipe deck and some ipe siding on front of terraces. I like twp 1500 California redwood and want to know what wouould last longer, that or ipe oil? Michael, nothing lasts long on IPE. It will need to be done annually no matter what. TWP though is not designed for exotic hardwoods such as IPE so you may have issues with penetration into your extremely dense wood. What deck cleaner would you recommend before re-application of Ipe Oil? IpeDeckOwner, you could use Restore-a-Deck Cleaner or Messmers Part A. It depends is the deck is exposed mostly to harsh sunlight or in rainy conditions. I am installing an IPE deck in November in Michigan. Can I apply IPE Oil in temps below freezing or should I wait until spring to use IPE Oil? John, definitely wait until Spring. Make sure to clean and brighten before staining. Thanks for the advice! What do you recommend I use in the fall – Restore-a-Deck or Defy? Do you sell any of these products? Can I cover the deck this winter with plastic to minimize dirt? The IPE deck will surround a Koi pond and I will need to be concerned about the health of the fish as I wash and brighten the IPE deck in the future. Can I apply and rinse these products by hand near the edge of the Koi pond or do I need to flush the chemicals off the wood after applying (making it problematic with the design of the Koi pond)? Will these chemicals harm Koi? Since you seem knowledgeable about IPE and are offering excellant free advice I would like to speak with you. I am in Ann Arbor…can we speak by phone or can I visit you? If possible, please send contact info to my email address. John, we are deck restoration contractors who offer our own experiences with products. I would try contacting the companies directly on where to buy. We have used the RAD products for prepping around ponds and such. They are relatively safe but you will need to rinse well after application and scrubbing. Do you know of a professional in Dallas who is skilled w/ cleaning and staining IPE? Paul, I do not know of anyone in Dallas personally. I'm trying to contract a guy to clean my porch/patio (IPE). He said he would pressure wash it, but I thought I was told that would splinter the IPE. I know the pressure can be regulated up or down. Is there an appropriate setting for IPE so the water doesn't harm the wood? Also, how important is it to use a brightner every year? Is it necessary to go over the entire porch/patio w/ IPE Oil or only the faded portions? Paul, using a deck cleaner or stain stripper while pressure washing is the way to go. Pressure varies depending on how close you are to the wood. If you use a cleaner then you can back off on the pressure and it will not harm the wood. When re applying you should always prep first with a deck cleaner. Best to apply the stain to entire deck. I have a customer considering the use of Ipe. They have a concern that any and all of the stain products will turn the deck surface a dark color as opposed to a lighter cedar look. Are there any products that can provide a lighter hue to the deck surface? Bill, not with IPE. The natural tones of IPE when stained will be a darker brown with a hint of red. You may need to use a different product similar to " Flood CWF for Hardwoods" that doesn't have red pigment color and dries clear. Ipe Oil turns the deck into dark chocolate/red color. Hate it. Will Ipe oil work on the rough side of a cedar fence (Austin, TX horizontal fence isntalled 2 weeks ago)? I have IPE siding and decks ont he property and trying to match the color of the fence as much as possible and trying to keep things simple. Have tried a couple of stains on the rough side of the cedar and they just don't look natural..any other suggestions? Yoli, you cannot make cedar look like IPE. You can use Ipe Oil on cedar but it will be a completely different color then the IPE wood. Why are some of these reviews done after one year and others after two? David, Hardwood stains will typically only last one year due to the density of hardwood. That is why we only test hardwood stains for 1 year. Thanks. I checked with a similar manufacturer and they said that sodium percarbonate is likely to dry the membrane out and recommended not using it and only scrub with a stiff bristle brush. thoughts? Mark, I really doubt that but I guess it is possible if you cannot rinse it well. Not sure what else you could do. I have a deck that is on the 2nd story of a house. Beneath the deck is a waterproof tpo membrane. I have looked into cleaning / enhancer options … but all have chemicals that I worry will dry out the waterproof membrane underneath the deck. 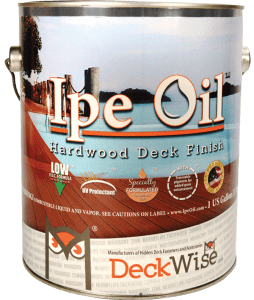 What would you suggest I use to prepare the deck before treating with IPE Oil? I've been thinking of just scrubbing it with a stiff bristle broom – which seems to work well is some test areas, and rinsing with water as there isn't much mold/mildew. Deck is around 4 years old and grey throughout. It was actually installed in two phases – over a few months, by the previous owner and there is a noticeable color difference between the two areas. Was hoping that IPE Oil would even out the color differences. Thoughts? Mark, I do not think a deck cleaner such as Defy or Restore-A-Deck will harm the membrane. As long as the wood is cleaned well then the IPE Oil should even out the color. I installed 1,000sf IPE deck about 7 years ago and the upkeep must be similar to having a boat. I have tired so many different products and every year I find myself pressure washing the deck and trying another product. The pressure washer has done a good job of removing the old product and gray but it tends to leave some splinters. This year I am going to give IPE Oil or Penofin a Try. John, IPE requires annual maintenance due to the extreme density of the wood. Best to use a stain that can be lightly cleaned and re coated as needed. Don't use penofin, I have 5 gal left in the garage, I used one on the lower part of my deck to see if it would hold up, I made it about 3 months and looked like crap. (Cincinnati summer so not to be of weather) I have tried all kinds of oils and stains with zero luck of looking good for even a spring summer, I'm going to give this Ipe oil a try, I have a 2200 ft deck so it's a big job, I sure hope it works, I'm getting tired of this crap every spring. Monti, IPE requires annual maintenance. The key is finding a stain the will last the season and can be easily cleaned and reapplied. Monti I have a similar size deck in Kansas City, MO. I am in the same situation, I am considering sanding the entire deck to remove all of the different appliacations over the years. Did you sand and have you tried the ipe oil yet? Scott, I was in the same predicament as you. I tried sanding with an industrial unit and the results were not good. I called IPE and they recommended using Benjamine Moore REMOVE stripper. You can adjust the strength by adding more water. It was easy to apply and the results were PERFECT. I sanded afterwards and used IPE Oil for the finish……looks like new. Hope this helps. Wish I could add a pic to show you. I agree. Penofin doesn't work well on Ipe, Madera, or even soft woods. My contractor used it on a new deck and rails and it molded after 3 months…in Southern California to boot. I have used Messmer's UV on my Ipe deck. The covered section still looks reasonably good after 3 years but the walkway has grayed out and needs to be stripped and finished. Messmer's sells a cleaner and brightener (two step product). I have used that and it works well. Have never sanded the deck. Hope this helps. If someone has used Messmers and Ipe Oil, I'd love to hear about the comparison. we are about to use ipe for our decking and are trying to find the best deck treatment to maintain the original look. we do not like the grey weathered look. we can not find comparisons of different treatments. should we stain first? Just had my deck completed about 3 weeks ago using ipe and have not had the chance to coat it with the ipe oil I purchased. Needless to say I already have a few stains on it from salad dressing and some darkening spots from where the deck chairs are. What do you recommend for cleaning and how long to dry prior to apply the ipe oil? Glenn, I would use a deck cleaner and deck brightener to prep. Be careful of dark spots under chairs. That could be rust! Let dry for a couple of days. You better reconsider using IPE or any "exotic" hardwood. Don, we had to remove your email as it will get picked up from spammers and you will get a bunch of spam. As for the deck, we would need to get permission from the homeowner if it is okay to give out their info. It was also redone I believe last year but I would need to talk to the contractor who helped us with the review to see.